Searing Strike: Slash an enemy with flame, dealing [3074 / 3106 / 3140 / 3175] Flame Damage and an additional [8138 / 8221 / 8307 / 8404] Flame Damage over 8.5 seconds. Venomous Claw: Cost: 1147 Stamina. Burning Embers: Slash an enemy with flame, dealing 3177 Flame Damage and an additional 8399 Flame Damage over 8.5 seconds. Heals you for [69 / 71 / 73 / 75]% of the total damage inflicted when the effect ends. 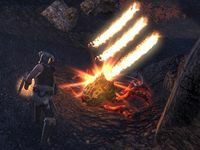 Searing Strike deals Fire Damage to an enemy and applies fire damage over time. The Venomous Claw scales off Stamina and Weapon Damage, and deals Poison Damage, with increased damage the longer the effect lasts. The Burning Embers morph heals you at the end of the effect. The healing from Burning Embers occurs when the effects times out, when the enemy dies, or when you reapply the effect on an enemy. The Venomous Claw morph was added in Update 10, replacing Unstable Flame, which dealt Flame Damage instead of Poison Damage. Burning Embers is a recommended morph for the Dragonknight Initiate and Inferno Dragon builds, while Venomous Claw is recommended for Venomous Dragon. Burning Embers: This ability's heal no longer stacks multiplicatively when multiple player characters cast it on the same target. Increased the damage over time effect applied by all ranks and morphs of this ability by approximately 15%. Unstable Flame: This ability now scales off Stamina and Attack Power and costs Stamina. Damage is mitigated by your target's armor. Unstable Flame: Renamed this morph to Venomous Claw. In addition, this morph now deals Poison Damage instead of Flame Damage. Venomous Claw: This morph now has a new icon. Venomous Claw: Fixed an issue where the damage over time did not increment in damage if multiple Dragonknights cast the same rank of this morph on the same target. Burning Embers: Fixed an issue where Rank IV of this morph was not allowing multiple Dragonknights to apply the Damage over Time component to the same target. The initial direct damage from this ability and its morphs can now be blocked and dodged.